An action for an account is a personal action against the defendant for the value of the property that he wrongfully dealt with. 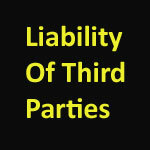 Unlike a constructive trust, the liability to account entitles the claimant to proceed against the person, rather than the property, that had been unjustifiably held by the defendant. The correct categorisation of this liability was not achieved until the late twentieth century when it became settled that the defendant is not a trustee and, in particular, not a constructive trustee. The defendant does not occupy the status of a fiduciary before the breach of trust but becomes a fiduciary only as a result of intermeddling with the trust property. The notion here is that the courts have recognised a cause of action for a personal claim to account, with the possible exception of a trustee de son tort. Accordingly, if the defendant is insolvent the claimant will enjoy no priority over other creditors. The aims of this lecture are to examine the theoretical basis of liability and to analyse the circumstances when a stranger to a trust may become liable to account for his wrongdoing. Such liability is imposed on a defendant who knowingly or unconscionably receives trust property for his own use and a defendant who dishonestly assists another in committing a fraudulent breach of trust.